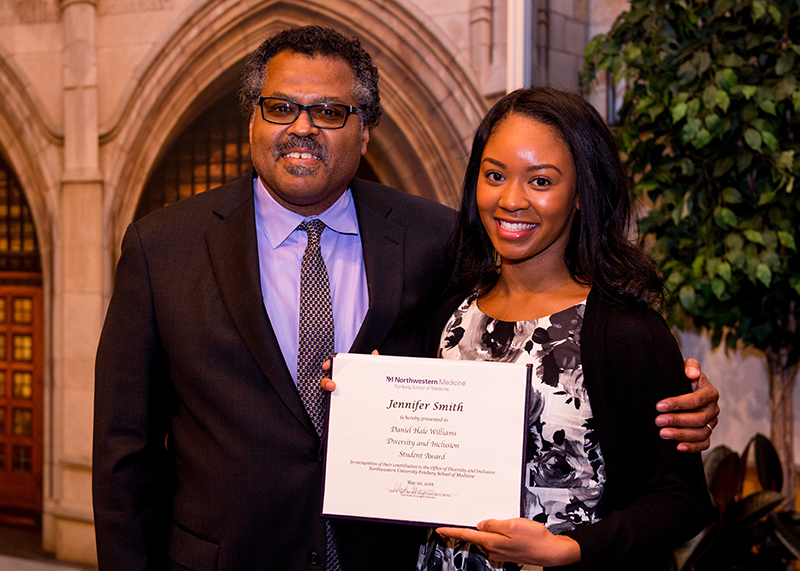 John Franklin, MD, associate dean for minority and cultural affairs, presented Jennifer Smith, ’16 MD, with the first Daniel Hale Williams Diversity and Inclusion Award for her efforts in promoting diversity and inclusion at Feinberg. More than 30 awards for academic achievements and teaching were announced at Feinberg’s fourth annual Honors Day on May 20, including the first Daniel Hale Williams Diversity and Inclusion Award, presented to Jennifer Smith, ’16 MD. 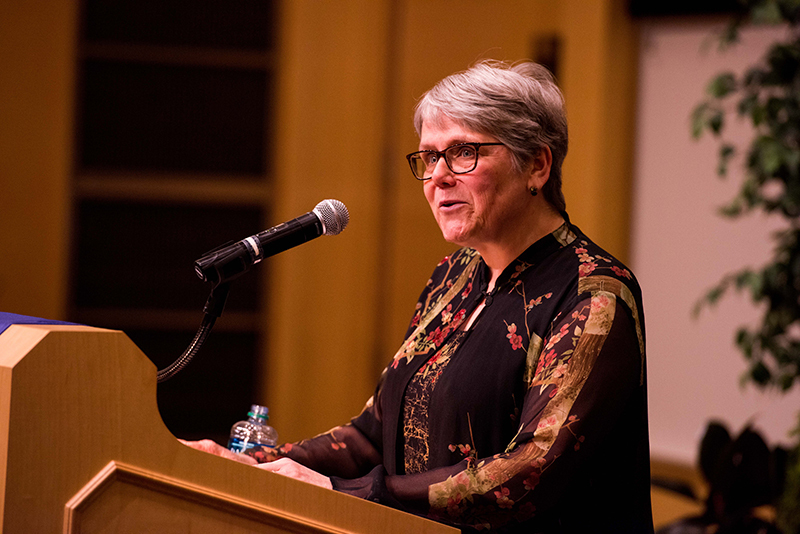 When Smith started her medical education at Feinberg, she was not only interested in health disparities, but also in creating an inclusive environment for Northwestern Medicine patients, medical students, residents and physicians. “It is a great honor to be the first recipient of this award and recognized for increasing diversity at Feinberg,” she said. Eric G. Neilson, MD, vice president for Medical Affairs and Lewis Landsberg Dean, opened the ceremony by welcoming students, faculty and guests. Harry N. Beaty Honors Day Speaker Pat Garcia, MD, MPH, professor of Obstetrics and Gynecology and of Medical Education, shared key points she learned over her career with the graduates. The Class of 2016 nominated Patricia Garcia, MD, MPH, professor of Obstetrics and Gynecology and of Medical Education, as the Harry N. Beaty Honors Day Speaker. In her remarks, Garcia shared key points she learned over her career with the graduates. Honors were handed out to faculty and staff throughout the ceremony. James Paperello, MD, associate professor of Medicine in the Department of Nephrology, for outstanding teaching in a large-group setting for the first year of medical school curriculum. Ajit Paintal, MD, assistant professor of Pathology, for outstanding teaching in a large-group setting for the second year of medical school curriculum. Thomas Corbridge, MD, professor of Medicine in the Division of Pulmonary and Critical Care and of Physical Medicine and Rehabilitation, for excellence in the clinical teaching of medical students. Michael M. Ravitch Award, Margaret Chapman, MD, instructor of Medicine in the Division of Hospital Medicine, for her outstanding teaching in a small-group setting. American College of Physician’s Award, Alexander Taylor, ’16 MD, for outstanding performance in the junior medicine clerkship. John T. Clarke, MD, Award, Balint Laczay, ’16 MD, for an outstanding graduating student pursuing a career in internal medicine. Eugene Bauer, MD Award for Excellence in Dermatology, Shirin Bajaj, ’16 MD, for outstanding overall performance in dermatology by a graduating student pursuing a career in dermatology. Department of Obstetrics and Gynecology Beatrice Tucker Award, Maureen French, ’16 MD, for outstanding commitment, service and advocacy toward improving women’s health. Louis G. Keith, MD, PhD, Award in Obstetrics and Gynecology, Douglas Gilchrist-Scott, ’16 MD, ’16 MPH, for outstanding contributions to women’s health research. Henry B. Betts, MD, Award for Excellence in Physical Medicine and Rehabilitation, Douglas Gilchrist-Scott, ’16 MD, ’16 MPH, for best performance during the Physical Medicine and Rehabilitation medical student clerkship rotation. Stephen M. Stahl Award for Excellence in Psychiatry, Patrick Hurley, ’16 MD, for an outstanding graduating student in psychiatry. Edward A. Brunner Medical Student Award in Anesthesiology, Matthew Goodmanson, ‘16 MD, for the highest level of academic excellence demonstrated by a graduating student pursuing a career in anesthesiology. American Academy of Neurology Medical Student Prize for Excellence, Margaret Yu, ’16 MD, for excellence in neurology during the third-year clerkship as wall as the selective experiences in neurology. Jan Reddy Excellence in Pathology Award, Jae Elkind, ’16 MD, ’16 MPH, and Alex Mays, ’16 MD, for excellent effort and learning on the pathology elective rotation. Gayle E. Woloschak Medical Student Award for Excellence in Radiation Oncology, Anish Butala, ’16 MD, for excellence in radiation oncology. James Thomas Case Radiology Award, Brian Trinh, ’16 MD, for best overall performance in radiology by a graduating student pursuing a career in radiology. Harold J. Pelzer Award, Matthew Purkey, ’16 MD, for outstanding achievement on the otolaryngology rotation. James A. Stockman III Award for Excellence in Pediatrics and Child Health, Ellen Ryan, ’16 MD, for outstanding performance in the pediatric clerkship and a passion for advancing the care of children through advocacy, education and research. John P. Phair Award, Taylor Poor, ’14 PhD, ’16 MD, for excellence on the infectious disease rotation in both the intellectual and human side of medicine. Julius Conn Jr., MD, Award, Ian Chow, ’15 MD, and Lily Saadat, ’16 MD, for outstanding performance in the surgery clerkship. Lee M. Jampol, MD, Award, Joseph Simonett, ’16 MD, for outstanding achievement in ophthalmology in clinical care and vision science research. Martin Lipsky Award for Excellence in Family Medicine, KJ Hansmann, ’16 MD, ’16 MPH, for a graduating student entering a family medicine residency who most exemplifies the characteristics of altruism, compassion and intellectual curiosity. Society for Academic Emergency Medicine Excellence in Emergency Medicine Award, Alex Ireland, ’16 MD, for excellence in the specialty of emergency medicine. James Kozlowski Award for Excellence in Urology, Amanda Vo, ’16 MD, for outstanding performance in urology. Frederick and Harriett Stenn Award for Humanism in Medicine, Allison Ducharme-Smith, ’16 MD, for demonstration of humanism and compassion in the practice of medicine. Neil Stone Award for Professionalism and Compassion in Medicine, Ellen Ryan, ’16 MD, for commitment to professionalism and compassion in medicine. Kenneth M. Viste, Jr., MD ’66, Student Service Recognition Award, Amy Rogers, ’16 MD, for outstanding service and contribution to Feinberg School of Medicine. Daniel Hale Williams Diversity and Inclusion Award, Jennifer Smith, ’16 MD, for excellence in promoting diversity and inclusion at Feinberg. John Philip Reder Award, Nitin Goyal, ’16 MD, for the Honors Program Medical Education Graduate who demonstrated outstanding leadership and extracurricular accomplishments with exceptional involvement in In Vivo.